If you follow our updates, you know that Henry is fully committed to his charity work with the RMCTF and Durrell Wildlife. And as you've seen in the past, Henry's giving nature also extends to other charities and those who seek to raise funds for them. Today David Ian Baluch let us know how a Superman costume signed by Henry, just raised funds for paralized athlete Eric LeGrand, at an official ‎Christopher & Dana Reeve Foundation‬ disability event this month. 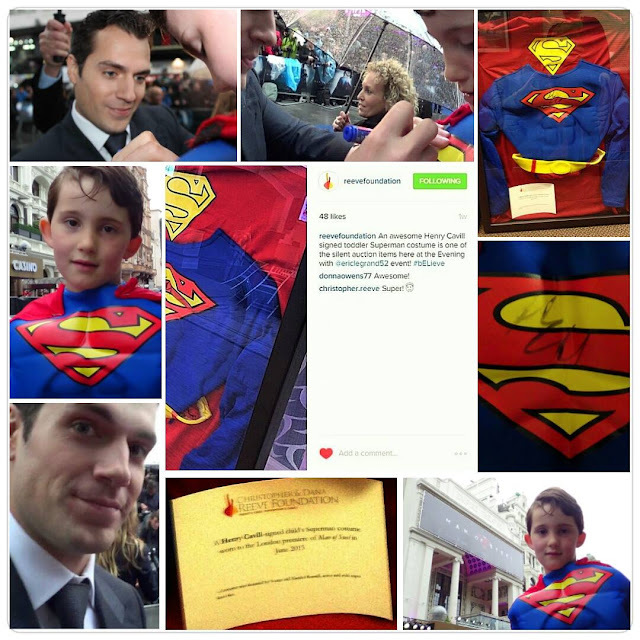 This is the video of Henry signing the costume at the London Man of Steel premiere, in June of 2013. Thank you so much for the update, David. We are so happy to see Henry's caring character, translate into help for those in need. Go Superman! Awe! Can he get any sweeter and generous. No wonder everyone loves him. I know in my heart that Christopher Reeve would be so honored by what Henry has done for that charity. Keep up the good work Henry. You are an exceptional man who has my utmost respect and admiration. WOW dating a 19 year old. That's a bit too young.